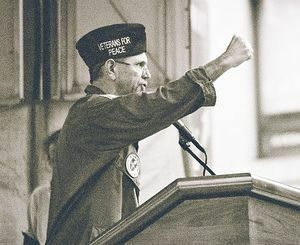 As at 2011, Elliott Adams served on the Board of Directors of Veterans for Peace. Veterans for Peace is a member group of United for Peace & Justice and seeks to "protest the immoral and disastrous Iraq War and oppose our government's policy of permanent warfare and empire-building". Elliott Adams, Senia Barragan (Student Representative), David Barsamian, Noam Chomsky, Carl Davidson, Bernardine Dohrn, Bill Fletcher Jr, Bert Garskof, David Graeber, Tom Hayden, Gerald Horne, Mike James, Robin D G Kelley, Mike Klonsky, Ethelbert Miller, Charlene Mitchell, Michael Rossman, Mark Rudd, Howard Zinn. On February 17, 2007, the Movement for a Democratic Society held a well attended conferenceat New York City’s New School University. The business portion of the meeting followed with each board nominee introducing themselves to the conference. The board, a very diverse group, was voted in by acclamation... Board nominees where were not able to attend the conference were included in the appointment by acclamation. The list included Elliott Adams, Panama Vicente Alba, Tariq Ali, Stanley Aronowitz, David Barsamian, Rosalyn Baxandall, John Bracey, Jr., John Brittain, Robb Burlage, Noam Chomsky, Jayne Cortez, Carl Davidson, Angela Davis, Bernardine Dohrn, Barbara Epstein, Gustavo Esteva, Lawrence Ferlinghetti, Stephen Fleischman, Bill Fletcher Jr, Tom Hayden, Gerald Horne, Florence Howe, Mike James, Robin D G Kelley, Alice Kessler Harris, Rashid Khalidi, Mike Klonsky, Betita Martinez, Ethelbert Miller, Roxanne Dunbar-Ortiz, Barbara Ransby, Patricia Rose, Michael Rossman, Studs Terkel, Charlene Teters, Jerry Tucker, Immanuel Wallerstein, Cornel West, Leonard Weinglass and Howard Zinn. In 2012 Elliott Adams served on the Board of the Vietnam Agent Orange Relief & Responsibility Campaign. This page was last modified on 23 May 2013, at 22:10.